As part of its ongoing campaign to convince health advocates that it isn't callously filling children's bellies with wildly unhealthy foods, McDonald's has decided to make fruits and vegetables part of every Happy Meal. Parents can already swap fries for sliced apples and low-fat caramel sauce, but only 11% of meals are served with "Apple Dippers." Now the chain has halved serving of french fries and included a healthy side dish which could consist of apples, carrots, raisins, pineapple slices, or mandarin oranges. 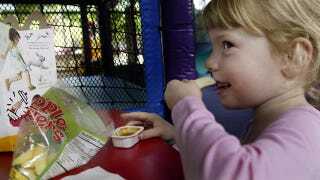 McDonald's is hoping the move will make parents feel better about ordering Happy Meals for their kids, even though most of the healthy snacks will probably remain in the bottom of the box.